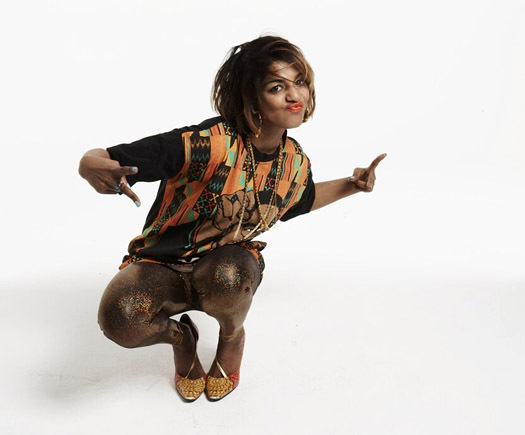 I've now listened to M.I.A. 's new album, Kala, for a while and I think you really should check it out. It's really strange, and seems like a mix between bad disco and electric noise on the first listenings, but it simply rocks. There are two versions of the MIA myth. Myth the first: Back in 2005, into a world increasingly obsessed with revivalism, a techinicoloured terrorist emerged from the streets of east London dressed like sonic the hedgehog at a basement rave and ripped UK music from limb to limb. Then, armed with neon thread, this visionary stitched it back together, creating a patchwork of rave, raga, rap and rock. She stretched time and space until they snapped, slinging any dilapidated concept of genre into the cosmos to be gorged on by a trio of luminescent hip-hop phoenixes. Myth the second: In 2005, into a world of genuine musical visionaries (Dizzee Rascal, Arcade Fire) a fluro idiot crawled inexplicably from beneath the nails of the zeitgeist. Backed by an incomprehensible melange of execrable sonic affectations, this bourgeois Londoner sang the praises of questionable military struggles in some of the poorest countries in the world while being dressed by the hippest designers in the west. Her unbearable vomit music was something forged in the flames of a thousand meaningless fads and she herself was destined for the pyre of fashion once her 15 seconds were over. Backed by an incomprehensible melange of execrable sonic affectations, this bourgeois Londoner sang the praises of questionable military struggles in some of the poorest countries in the world while being dressed by the hippest designers in the west. Her unbearable vomit music was something forged in the flames of a thousand meaningless fads and she herself was destined for the pyre of fashion once her 15 seconds were over. Then, armed with neon thread, this visionary stitched it back together, creating a patchwork of rave, raga, rap and rock. Her unbearable vomit music was something forged in the flames of a thousand meaningless fads and she herself was destined for the pyre of fashion once her 15 seconds were over. I love her album so much! A very talented lady. t's "body rounds 6-11." You just don't need that many rounds. My little guy is all tummy! Too tall tummy! with those filthy spammers putting links on my blogs. It’s just not being lazy moderating but I just don’t have time moderating. I've watched M.I.A on Exit festival. What atmosphere. So much energy on the stage. Have a nice day, Proactol. Unique Hoodia diet pill offers users a brand new way of losing the flab. Normal Unique Hoodia consumption can aid you to minimize your calorie intake, therefore assisting you to shed off up to 6 pounds each weak and that too without creating any side effect to your whole body. MIA British musician is very famous music band.And Kala is the music album of this band.In this album hip hop and disc based songs are so available. This music album famous in all over the world. Houston Home Security on 30 minutes to develop a crappy todo-list? dude!